Bottle Spray Cooling Tunnel/Equipment---Bottle Cooling tunnel/warming tunnel can reduce the temperature of hot filling drinks to 35-40 degree or increase the temperature. 1.Bottle warmer:The filling temperatuer of carbonated drink is 0-4 celcius degree, and the environment temperature is 20-30 degree, so the filled bottles will be full of water drops if they are not warmed, so the bottle warming machine warms the bottles by spraying warm water from the nozzles to the outside walls of PET bottles to keep the bottles warm and away from water drops, and and make it convinent for labelling. 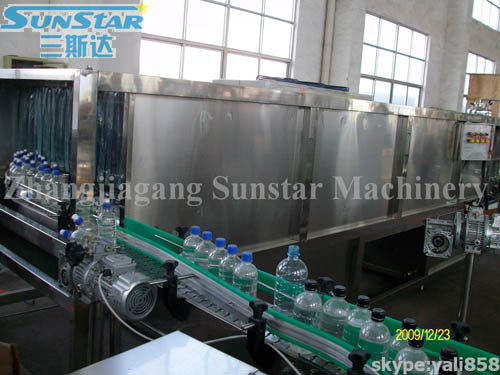 2.Cooling tunnel:This machine adopts a three section cooling water recycling cooling design.The first section uses water at 85-65 degrees;The second part is at 50-35 degrees, and the third part adopts aseptic water spray.The outlet bottle temperature is below 35-40 degrees. 1)The chain plate apply anti-friction and high temperature resistance engineering plastic. 2) Apply advanced PLC controller to assure all action precision. 3)The conveyor is frequency controlled. 4)All spray tubes are made of stainless steel and spray evenly. 5)All spray nozzles are made of engineering plastic. 6)The catchment flume is made of stainless steel and equipped with a level alarm device. 7)The spray-cooling tunnel has a spray cooling recycling water pump.